Good Morning it is a glorious fall day again for us! Yeah! We have been busy with my kids and their dogs here. So much fun, alot of cooking! 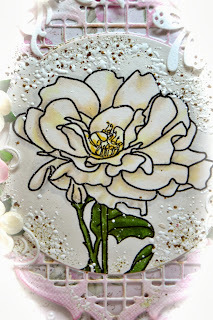 Here is the 2nd card I made for my relative whose mother recently passed away. I showed you the first one on Sunday this past week. 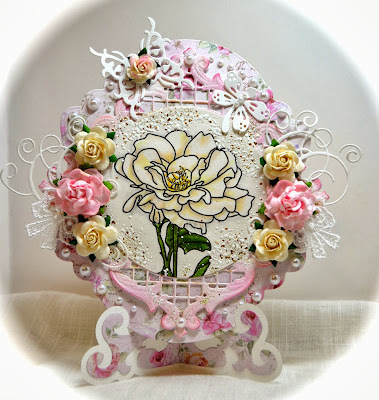 The frame is Quic Kutz Nesting Frame 9 and then I used the Joy die 6002/0147 and inked it in SU Pale Plum to coordinate with the beautiful Sofiero papers from Maja Design. I made a easel to hold it up next to her mom's photograph from Marianne Design. 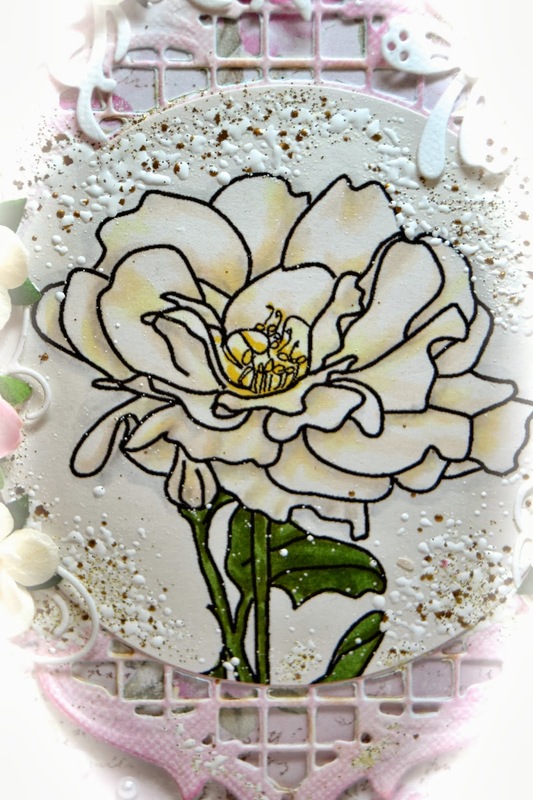 I colored the Gardenia in Copics and used the Shabby White Frantage around the edges of the flower. 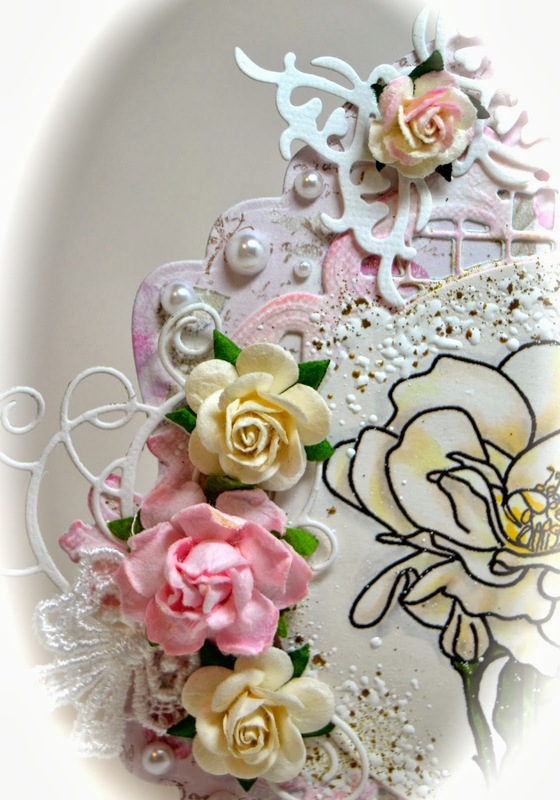 Here you can see the beautiful roses from WOC with the Memory Box die Elegant Scrollwork. There is also a Magnolia Doohickey dragon fly on it. 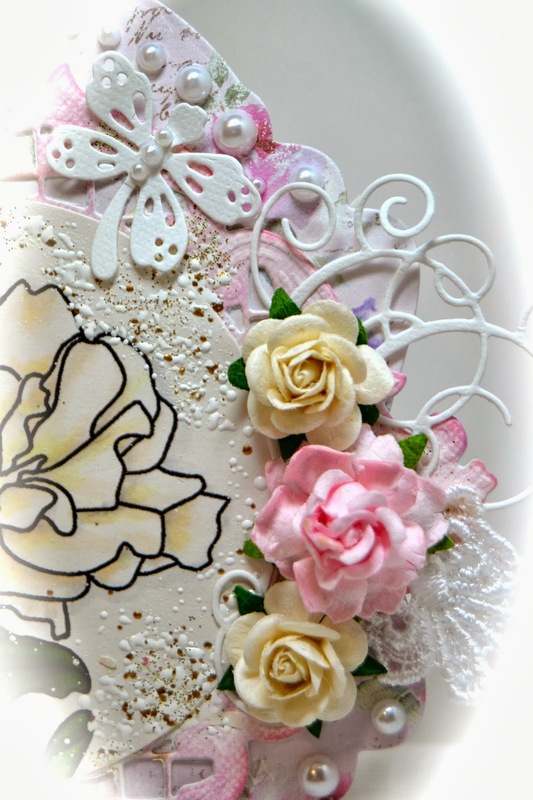 In the upper corner I used La La Lands corner die and made a butterfly out of it. On the back of this card I put a glassine bag for 2 tags. 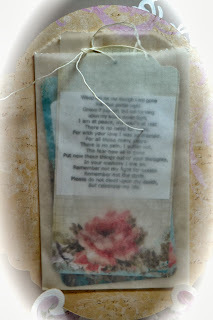 The tags are from Scrap Cake and I put on 2 different poems so she could read them when she would like to. 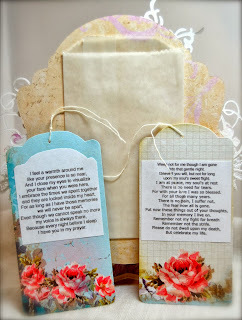 I had to make her 2 cards, as a crafter you cannot just have 1 to choose from! lol I really did not know the style she would like so a variety for her is best for her comfort. Thank you for stopping by today and I wish a great rest of your week. 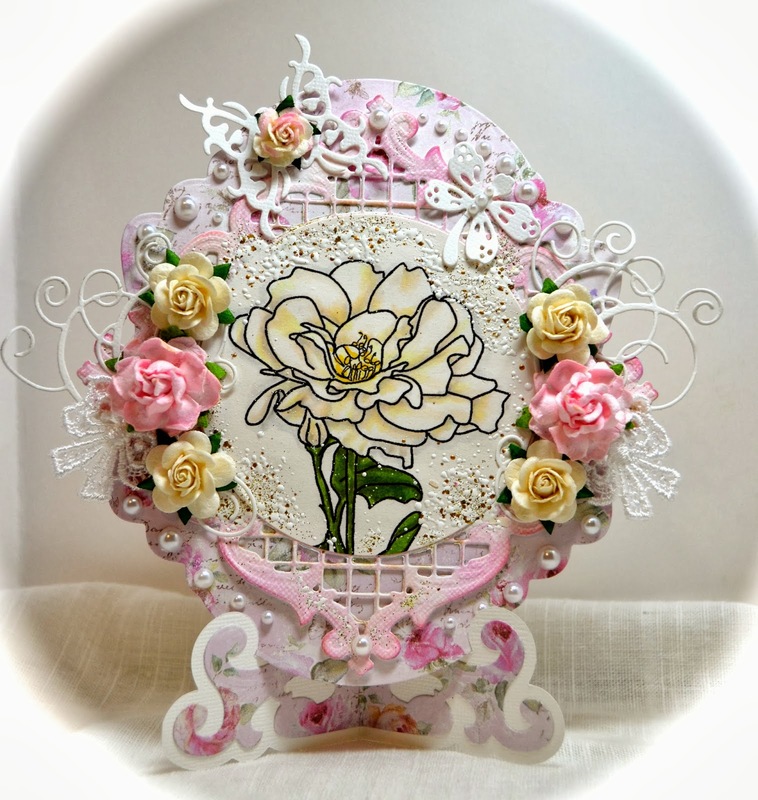 Oh this is beautiful Kelly… such a peaceful looking image and the embellishments are stunning… I love the delicate die cuts and the flowers… I'm sure your relative appreciated this card - it's very special indeed! Another beauty Kelly! Gorgeous colors and details and I love the easel. Your relative will cherish these and poems. I'm loving the frantage too! This is soooo precious Kelly! your put somuchlove on your project, that it breathes just that! ( hope I make sense) wish I could say this in french! anyways, the feeling of peace and love just comes through the screen. 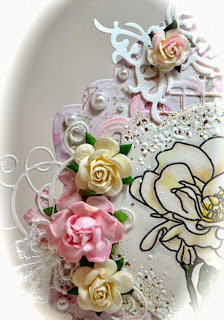 Love all the pretty embellishements and details. Fabulous work! Hugs. Absolutely stunning! Now this is feminine and girly (LOL). Am I rubbing off on you? I didn't realise I'd got so far behind, I'm so sorry. 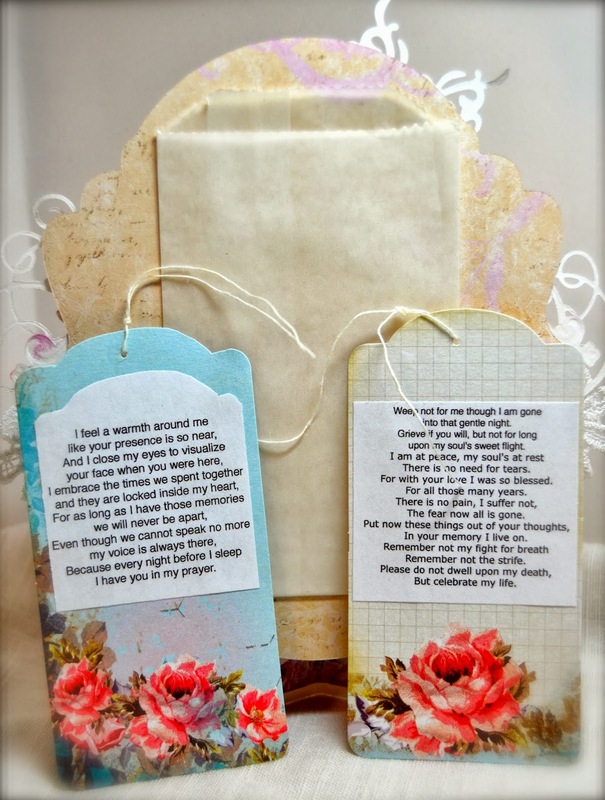 This is such a lovely and thoughtful make for your relative... what a wonderful thought to include the poems, and allow her to choose when to read them. Beautifully done, Kelly.